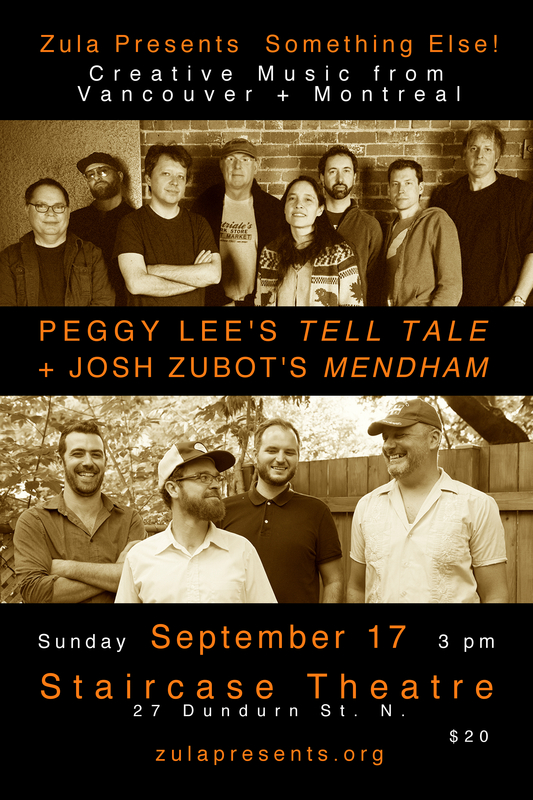 Peggy Lee Octet will present music from its debut CD, Tell Tale (Drip Audio 2016) at the 2017 Guelph Jazz Festival and venues in Montreal, Brooklyn, Toronto and Hamilton, September 12-17. The music for Tell Tale was first conceived in 2009 as Film in Music, a response to writer/creator David Milch’s HBO series, Deadwood. The eight-piece band of improvisers drawn from Vancouver’s rich creative music community is understood as analogous to a cast of characters in a story––within the framework of a composed musical suite, each improviser contributes to the unfolding musical drama through small ensemble improvisations and solo ‘monologues’. The seven composed sections imply the arc of a story and act as launching pads for extended improvised statements that take the listener on a journey that is never the same twice. The musical narrative travels from lush, tender beauty to stark abstractions–from playful exchanges to dense confrontations–always ending with a wild, off kilter parade. 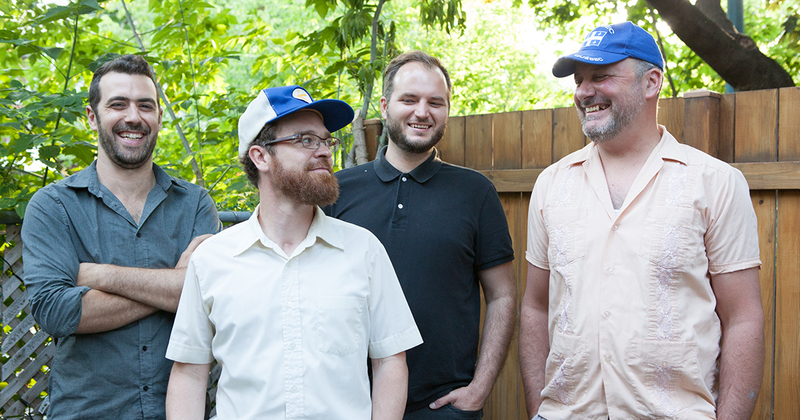 The ensemble features some of Vancouver’s most well-known improvisers, all of whom are master musical story tellers capable of conjuring up rich sonic atmospheres and landscapes. Peggy Lee and her band take listeners on a cinematic ride inside the music. Tell Tale has garnered rave reviews locally and internationally. Composer, cellist and band leader Peggy Lee makes her home in Vancouver, B.C. where she records and performs with long-time music associates including Tony Wilson, Ron Samworth, Dylan van der Schyff, Wayne Horvitz and Robin Holcomb. Peggy also leads or co-leads a number of music projects: The Peggy Lee Band, Film in Music, Echo Painting, Handmade Blade with JP Carter and Aram Bajakian, Waxwing with Tony Wilson and Jon Bentley, and Beautiful Tool with Mary Margaret O’Hara. Peggy received the Freddie Stone Award for integrity and innovation in music in 2005 and the Vancouver Mayor’s Arts Awards for music in 2013. Imagine a modern-day Duke Ellington combo spiced up with shards of noise, and you’d be on the right track; it’s music that combines the timeless and the otherworldly in equal measure. Elite Vancouver musicians join Lee exploring deep cinematic textural journeying and Zen-like moments. Haunting solos transcend from the rapturous Lee. This entire disc is more like a journey or series of stories, moving gracefully from scene to scene. Another winner from the ever-expanding Vancouver scene. Don’t miss it. MENDHAM is a high-energy avant-jazz group led by violinist Joshua Zubot (Sam Shalabi, Lori Freedman). Melding swing, new music, free improv, speed metal, and noise, the Montreal group is known for its propulsive and beautifully ecstatic mayhem. MENDHAM spontaneously feed off of one another, grabbing and throwing out ideas at an alarming rate. Jason Sharp’s raging baritone sax crashes into Isaiah Ceccarelli’s machine gun drumming and bursts the music wide open. Nicolas Caloia’s bass balances the group while Joshua Zubot’s hyperactive violin keeps the music teetering on the thrilling edge. Until his 2016 move to Vancouver, violinist Josh Zubot was a ubiquitous presence in Montreal’s music scene with groups like the Subtle Lip Can, Ratchet Orchestra, Quartetski, In the Sea, as well as pop bands like the Barr Brothers. Equally at ease with classical playing, bluegrass fiddling, and the scrape and pluck of extended improvisation, Zubot is one of the most impressive improvisers at work in Canada. MendHam is his Montreal quartet, a band of massive intensity that can turn on a musical dime and – underpinned by the simpatico bass-drum pair, Nicolas Caloia and Isaiah Ceccarelli – loves to swing. Baritone saxophonist Jason Sharp is a powerful soloist who, in the thick of group playing, is almost akin to a rhythm guitarist at points. A dazzling band. Huge thanks to Guelph Jazz Festival for not only helping create the opportunity for these talented artists to tour our region, but also for encouraging us in the vicinity to present said artists… thank you for the support and the generosity, Guelph Jazz Festival! Their line up this year is out of this world and we should all support festivals so rich in cultural value in our vicinity… let’s support one of the finest festivals anywhere, by attending!